We all know that clinical practice is a calling, but any calling worth answering obviously takes its toll on our time and energy, and that may be ignorable when we’re young, but soon enough it gets hard to work around that little voice in our head saying we’re set in place and that new things just ain’t happening if they didn’t happen already. So, seasoned clinicians, this episode is for you, because we’re taking a page out of today’s guest’s playbook. And it’s a special treat for me since that guest happens to be fellow ReachMD host Dr. Mimi Secor. Welcome to Book Club on ReachMD. I’m Dr. Matt Birnholz, and today I’m joined by the venerable ReachMD host, Dr. Mimi Secor, who, in addition to being a renowned women’s health expert, is also a nationally recognized health guru, champion bodybuilder, and author of the book Debut A New You. Dr. Secor, welcome back on the other side of the interview. So, to start, Dr. Secor... and I hope you don’t mind if I call you Mimi. You’re absolutely welcome to call me Matt, given how many years we have known each other. Can you just give our audience a little background on your career and your motivation for writing Debut a New You? Absolutely. So the deal is I’ve been a nurse practitioner for over 40 years. I started as a little baby nurse practitioner at age 22 and worked in a lot of different settings, done a lot of things, been an educator a good chunk of that time that I clinically practiced. As you know, I’ve worked with ReachMD hosting programs. And I decided at the ripe young age of 59 I’d go back to school, earn my doctoral degree—because I really wanted to know what that was all about—and in the first semester of my program, I realized I was really stressed. I wasn’t sleeping. I was eating too many carbs. I was gaining weight. I was panicked. And my daughter at the time happened to be home, and she said, “Mom, what are you doing?” I said, “Honey, I’m studying.” She goes, “No, you’re a hypocrite. You don’t even know how to deal with stress. You’re not even a role model. You’re supposed to be a role model.” And it was like a stake in my heart, Matt. I just realized that I wasn’t walking my talk. So I said to her, “Look, I really don’t have the time. How about if we work on this in 2 years?” She goes, “No, I’m going to help you right now.” And she’s a bodybuilder, and she was getting ready for a show, and she said, “I’m just going to have you do what I do. Here, drink this glass of water. Guess what, mom. I’m going to make you go to the gym. You don’t have to stay 2 hours, but you’ve got to go and learn how to lift weights.” It went on and on like that. So, over the 2 years, somehow I survived the doctoral program and lost 30 pounds, 12 inches off my waist, and I actually felt better and looked better than ever in my life. I said, “Man, oh man, I’m on to something. We’re on to something.” So I really felt compelled to share with others, to inspire others, so I wrote, basically, this book as a how-to guide to help busy, stressed-out healthcare professionals especially get healthy and happy so they’d be more successful clinically and actually be less at risk for errors. If you’re not burned out, you’re not going to be as likely to make errors. So it’s been an improbable journey. And I honestly wish we all had somebody like your daughter in our lives to help push us to that new place. But I’m wondering, on the way through that journey, how did you know that this was going to be something that would stick and not just be another New Year’s resolution? I have to tell you, Matt, I think that what I learned is that the changes we make have to be changes that we can live with. They need to be sustainable changes. They can’t be the latest fad diet. They can’t be like a crazy approach to life that you can’t maintain. So the changes she helped me make were changes that I plan on keeping in my lifestyle for my entire life, whatever lucky amount of time I have left. So it wasn’t easy, but it wasn’t as hard as if it had been a very unnatural process. This was a very natural process of very small changes. And as far as that process goes, did you have an idea of the end goal in mind when you started along this track with your daughter? Or maybe she had an idea of the end goal in mind where this path was going to lead you. Or was it more of a wait and see phenomenon, just step-by-step and just see what happens? Honestly, for me it was survival. I really didn’t have an end goal. And, honestly, I was shocked at where I was 2 years... You know, I graduated 2 years later. I was shocked. And then I realized, “Good grief, I wish I had learned these skills, I wish I had learned what I know now back when I was just starting out”—another reason I was compelled to write. And now I teach with my daughter to help other healthcare professionals get it together. I want to come back to that degree, because obviously, it’s a lot to take on. You’re getting this doctorate. You’re finding that things are sort of falling apart, just trying to hold it together as you’re pursuing it. I think a lot of us can identify with that at any time in which we were receiving that training. But then you pull it together; you get a whole new system going. Was it sort of an all or nothing, or was it one piece at a time? Oh, Matt, it was definitely one piece at a time. Like I said, I remember her first saying, “Here, drink this water. Quit having more coffee and more tea and just drink this water.” And, “Oh, here, have 4 ounces of chicken. I just weighed and measured it and recorded it for you in MyFitnessPal, and guess what, at some point you’re going to start doing that too.” So it was real small changes. And I have to say I resisted everything—because that’s what we do as humans, we resist everything. So it was push and pull, push and pull, push and pull. And for those just tuning in, this is the Book Club on ReachMD. I’m Dr. Matt Birnholz, and today I’m speaking with friend and fellow ReachMD host Dr. Mimi Secor about her unique career and achievements highlighted in her book Debut a New You. So, Mimi, I’m sure that there are several listeners out there who are looking at what they considered to be a terminal degree in their careers where they are at and just maybe reevaluating that now given your own experience of looking at the age of 59 and saying, “Hey, let’s see where this goes,” and starting a whole new degree. So, as someone who’s achieved that later into your career, how do you motivate other clinicians to pursue more training at any stage? Well, I think they have to motivate themselves, but they have to dig down deep and realize that you can pursue your dream at any age. Honestly, we give up on our dreams. We think they’re for young people, and they’re not. If we wake up in the morning and we have the good fortune to be alive, if it’s really a dream that you want to pursue, you can do it, and you can do it better when you’re older if you’re taking very good care of yourself. If you have this extreme stress and if you ramp up your reaction to it with what I call extreme self care, you’re actually going to do better academically because your body is going to feel better, your brain is going to function better—everything about you—you’ll have more joy in your heart, more resiliency. So I think you can get away with being kind of a train wreck when you’re younger, but it’s going to catch up with you when you’re older and interfere with pursuing your dreams later in life, so I’m a big fan of extreme stress requires extreme self care. It’s an interesting concept, extreme self care. I imagine, at least on the early end, that presents some extreme obstacles that people that you work with and you, yourself, encountered. Tell us a little bit about those barriers and how you recommend people overcome them. Well, the barriers are real. In fact, most of us are the kings and queens of excuses. I know I was always the queen of excuses. I hear it all the time. I interact with clinicians at conferences nearly every week, and I hear them say, “I don’t have time. I don’t have energy. I don’t have money. I don’t have this. I don’t have that. I don’t have a trainer.” We have millions of excuses, and it’s just a way of our brains not wanting to change, because change is hard. So, what I’ve learned is, if you can start making small changes and be consistent and persistent and do a little bit of planning… It doesn’t even have to be a lot of planning. It used to drive me crazy. My daughter would say to me, “Well, mom, if you fail to prepare, you’re preparing to fail.” And now I say it and I believe it. You have to be prepared. Even at work you can take something like protein powder with 100 calories in it and 20 grams of protein, mix it quickly in tap water and chug it down, and that’s going to be way better for the next 3 hours than skipping meals, which is going to cause your brain not to think clearly and you’re more likely to make errors and feel horrible. Exactly. And I want to come back to that idea of time and energy as excuses. Obviously, if somebody’s looking to make extraordinary steps in caring for themselves, completely changing how they are leading their lives, it doesn’t change the fact that they still have limited time, they still have limited energy, because their responsibilities don’t change in the clinical practice world. So, how do you recommend that people move forward on making those big changes while they are maintaining everything else, so to speak? So, Matt, I’m now a big fan of planning and preparing and scheduling everything. So there are times in the week that all of us as busy clinicians have a little more time, and that’s when you want to make appointments with yourself. You want to look at, “When can I get to the gym?” “I’m putting that in my schedule book just like I put my medical and health appointments in.” And, “When do I have a little time for meal prep so I can grab and go what I need to take to work with me so I’m not withering on the vine all day long or grabbing food that’s in the break room that’s more than likely not healthy?” So just a little bit of planning, it doesn’t have to be huge. Everyone thinks they’ve got to create a care plan out of this whole project. It doesn’t have to be this huge, complex project. That’s another excuse. “Oh, it’s too complex for me.” Or I hear the excuse, “Well, you can do it. You have a flexible schedule.” Guess what, I travel all the time. Just the fatigue alone of traveling all the time is comparable to working long clinical hours. So the planning, I think, is key. I think we can all attest to that. All right, Mimi, I’ve got to ask you, even though you have literally written the book on changing life pursuits and goals at any stage, what’s next for Mimi Secor? Well, I’ve already kind of jumped into it. I mean, I’m really excited about reconnecting on ReachMD, but I’m also very excited to be co-teaching with my daughter. And our entity is known as Coach Kat and Dr. Mimi. And I used to go to conferences and I would hear people’s sad stories and I had nothing to offer. Now I do not only 15-minute free calls with people that really just want a lifeline thrown to them, I do 1-hour strategy calls with clinicians that really, really want a kind of roadmap to changing their lives. And then we also teach 6-month online programs. We have students from all over the country involved in changing their lives, and we hold their hands; we offer everything that they need—online classes, support every week, closed Facebook page, you name it. And I’m totally passionate about it—my daughter is too—because, do you know what? Being a healthy role model is powerful medicine. If we can model the kind of change we want to see in patients, that’s huge, absolutely life-changing. And just for our audience, tell us where they can find this tag team life-changing group? Where can they find you? Well, you can find us on Facebook. You can look up Mimi Secor. You can look up Coach Kat and Dr. Mimi. We have 2 Facebook pages. I have a new-age app, and the way you can get my new-age app is you can just text Dr. Mimi, D-R-M-I-M-I, just like you’re texting a message to a friend, and the phone number is 36260. That’s 36260. And that new app they can download right on their phone so they can reach me any time, and they can get to all my social media that way. They can sign up for my mail list, whatever is easiest for them, whatever their technologic preference is. I have to tell you, Matt, I’m just thrilled to be able to offer a lifeline to my colleagues, my NP colleagues, my PA colleagues, my physician colleagues, to be able to offer them an opportunity to change their lives, too, so they can be healthy, happy, joy-filled, feel more confident, be more competent and be more successful, ultimately. Mimi, I’ve got to say, what I love about your story is that it stands as a true testament to the value of going after whatever dreams inspire and motivate us—and clearly no matter when we choose to act on those dreams in your case. Dr. Secor, as always, it’s great to connect with you on the airwaves, but a special thanks goes out to you for sharing your personal story on life transformations today. It’s great having you on this side of the program. Thank you so much, Matt. It was my pleasure and honor. I’m Dr. Matt Birnholz. To access this and other episodes in the series, visit ReachMD.com/BookClub where you can Be Part of the Knowledge. Thanks for listening. After working as a nurse practitioner for forty years, would you embark on a journey to debut a new you? 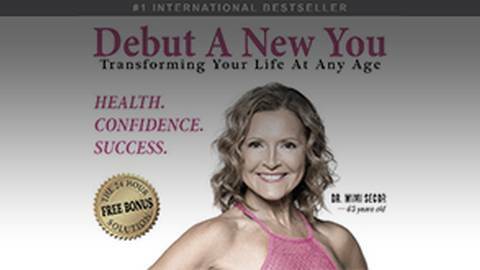 Compelled to share her personal experience, Dr. Mimi Secor, author of Debut a New You: Transforming Your Life at Any Age, speaks with Dr. Matt Birnholz about her journey from busy and stressed to happy and healthy.